Incivility Isn’t What’s Wrong With American PoliticsThe term is just a euphemism that lets the GOP point a finger at those fighting injustice, and away from themselves. Kavanaugh Is Becoming a Headache the GOP Could Do WithoutEven as they try to save Trump’s Supreme Court pick, Republicans are preparing for a “post-Kavanaugh” world. Paul Ryan’s ‘Welfare Reform’ Plan Looks DoomedMany Senate Republicans do not want to take food and medical care away from the poor and elderly (in an election year, anyway). Here’s What’s in the Final Draft of the GOP Tax BillSome of the worst provisions in previous bills have been scrapped. Most remain. Republicans Have the Votes for a TBD Tax BillFifty-one GOP senators have agreed to vote for a tax bill that does not yet exist. Trump’s Obsession With the Number 20 Imperils the GOP Tax BillRepublicans could solve all of their tax package’s problems easily — if the president weren’t arbitrarily fixated on a 20 percent corporate tax rate. Susan Collins Is Sure This Will All End Great for EveryoneMcConnell promised Collins that the GOP won’t slash Medicare — and will shore up Obamacare — if she votes for tax cuts first. The Trump Tax Cuts Pass in Committee, Head to the Senate FloorIt looks like this thing is gonna pass — if Mitch McConnell can keep all of the promises he just made. The GOP Tax Plan Might Make Sense — If Recessions Didn’t ExistRepublicans are writing a bill that will stimulate the economy in the middle of an expansion — and automatically depress it during a downturn. Here’s How Republicans Plan to Get Their Tax Bill Out of the SenateSeven Senate Republicans have expressed concerns about the legislation. 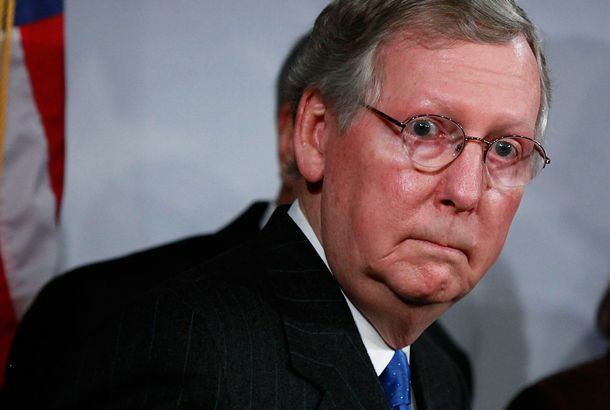 Mitch McConnell hopes to win them over with these last-minute changes. Republicans Can’t Afford Their Tax-Cut HabitThe GOP needs to slash the cost of its plan. But every time Republicans find a new revenue source, they decide to spend the money on another tax cut. Trump Is Afraid His Tax Plan Is Doomed. He Should Be.The Senate’s margin for error is slim, the divisions among Republicans are massive, and the tax plan is half-baked — and wholly unpopular. The GOP’s New Budget Tries to Keep It Simple: Big Tax Cuts for the RichDespite temptations to massively cut spending or launch a new health-care bill, the Senate is keeping its eyeson the prize of tax cuts. Politics Group-Chat: What to Make of Moore Winning Alabama’s GOP Senate Primary?Listen in as three New York writers figure it out. Parliamentarian Deals Trumpcare a Final Death BlowNow, a bipartisan health-care bill may rise from its ashes — if Senate Republicans can convince Trump to pursue solutions over sabotage. It’s an Abomination That 49 GOP Senators Voted for ‘Skinny Repeal’Republicans came within one vote of passing a health-care bill that they wrote over lunch — and admitted was a “disaster.” That’s a national crisis. Senate GOP to Reform Health-Care System on the Fly, in a BlindfoldSenate Republicans don’t know what their bill is or what it does. But they’re going to vote on it, anyway. Voters Encourage Trumpcare’s Republican Opponents to ‘Stay Strong’On July Fourth weekend, Senate Republicans either hid from their constituents — or were showered in praise for not passing their health-care bill. GOP ‘Moderates’ Seem to Be Winning the Negotiations Over TrumpcareMcConnell is reportedly giving moderates more opioid funding, larger subsidies, and fewer tax cuts while giving far-right dissidents little. Senate Delays Trumpcare Vote Due to Lack of SupportMitch McConnell had planned to pass Obamacare repeal before the July 4 recess. Now, he doesn’t even have the votes to proceed to debate. GOP ‘Moderates’ Worry Gutting Medicaid During Opioid Crisis Might Have DownsidesSome Senate Republicans are realizing that there’s a tension between solving the opioid epidemic and throwing millions of people off health insurance.